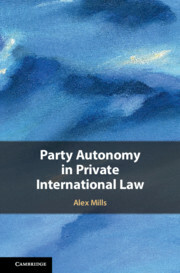 This book provides an unprecedented analysis and appraisal of party autonomy in private international law - the power of private parties to enter into agreements as to the forum in which their disputes will be resolved or the law which governs their legal relationships. It includes a detailed exploration of the historical origins of party autonomy as well as its various theoretical justifications, and an in-depth comparative study of the rules governing party autonomy in the European Union, the United States, common law systems, and in international codifications. It examines both choice of forum and choice of law, including arbitration agreements and choice of non-state law, and both contractual and non-contractual legal relations. This analysis demonstrates that while an apparent consensus around the core principle of party autonomy has emerged, its coherence as a doctrine is open to question as there remains significant variation in practice across its various facets and between legal systems.